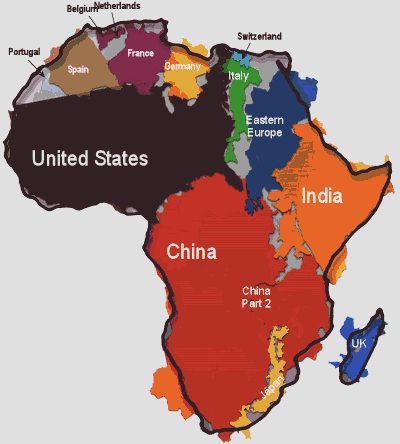 As a matter of fact, Africa is the second largest continent. That fact is overridden by my visual memories of the world maps I saw at school. They were made with a Mercator projection which causes lands further from the equator to appear larger than they are. So North America appears to be larger than Africa. The Democratic Republic of Congo, where Dayle and I have been working, is as large as the United States east of the Mississippi. The map may hide that fact, but it becomes so clear when working there. Someone named Kai Kraus has done us all a favor by producing a unique map of Africa that illustrates its real size in an unusual and helpful way – by filling it with the US, China, India, and a number of other countries. • More people live in Africa than in any other continent except Asia. • Almost one out of three countries in the world are in Africa. • The climate varies from hot and dry to hot and humid to mild. Here is a link to another map based on the same idea: http://bigthink.com/ideas/21084. Learn more about Africa and out work there by subscribing to this blog, talking with us on Facebook, or signing up to support us through prayer or finances. This entry was posted in Africa and tagged africa map, maps. Bookmark the permalink.